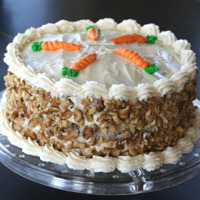 A perfectly moist, delicious carrot cake. The raisin or date mix-in method adds a delicious and even sweetness throughout the cake. 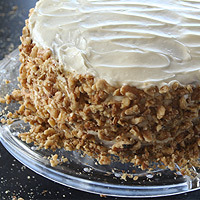 The walnuts balance the sweetness of the frosting. 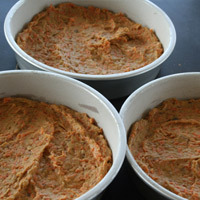 The finely shredded carrots create a moist, sweet, delicate crumb. Give yourself plenty of time to make this. Fortunately, it stays good in the refrigerator for several days, so you can make it ahead of time. You can stop at the cream cheese frosting and it's delicious. For a special occasion however, it's worth extra work of decorating. See the recipe at the bottom for make-ahead tips. Preheat oven to 350. Position the oven rack to the middle. 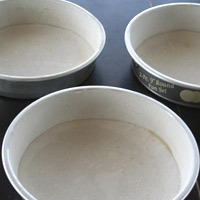 Prepare two or three 8 or 9 inch round pans. Place one of the pans on top of a piece of parchment or waxed paper. Trace around the bottom with a pen, or slide a scissors around the bottom to score the paper. Cut out and repeat. Spray the bottom of the pan with cooking spray. Place the prepared paper inside. Smooth out any air-pockets and seal around the edges. Spray and flour the paper and edges. Shake out any excess. Set aside. 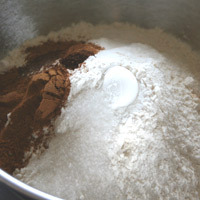 In a medium bowl add flour, baking powder, baking soda, salt, cinammon, nutmeg and ground cloves. Mix well and set aside. Peel and finely shred the carrots. Measure and set aside. Make the raisin or date mix-in by chopping or blending them finely. Immerse in water and break apart with your fingers. Drain water and squeeze dry in several paper towels. Measure and set aside. Finely chop the walnuts. Measure and set aside. For best results finely shred the carrots using the thinnest setting on a cheese grater. This gives the cake the best moisture and taste. If you use a food processor or a larger sized grate you will taste bits of carrot and the cake won't be as smooth and even. Using the dried fruit mix-in method gives excellent results. It adds a subtle raisin or date taste evenly throughout the cake. I like this a lot better than chewing on large raisin or date when I want to be enjoying the cake. Finely chopping the walnuts disperses them evenly throughout the cake. This gives it a better taste and makes it easier to slice. 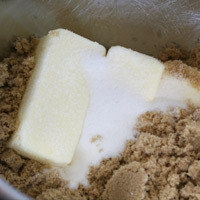 In a bowl of an electric mixer add butter, sugar and brown sugar. Beat on high 2-4 minutes, until light and airy. Add eggs and vanilla and beat until just blended. 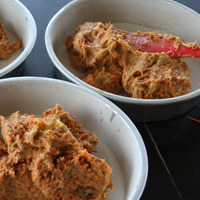 Change from the whisk to the paddle attachment and mix in the shredded carrots, raisin or date mix-in and walnuts. Mix on low until just blended. 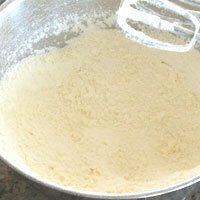 With the mixer running on low add the flour mixture 1/2 - 1 c at a time until just blended. The mixture will be quite thick. Divide evenly among prepared pans. Spread as evenly as you can. Bake for 20-30 minutes depending on the size and number of pans. Let cool for ten minutes, then run a knife along the sides. 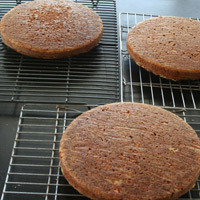 Place the cooling rack on top of the cake pan and invert. Remove parchment paper. You can let it cool like this, but I like to flip it one more time to have the domed side up. This way the cake doesn't get squished in the middle. Cool completely. Prepare the cream cheese frosting. With an electric mixer beat the cream cheese and butter until smooth. 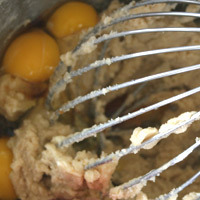 It often will get stuck in the whisks, but keep beating until it releases and begins to stick to the sides of the bowl. If you skip this step you may end up with a lumpy frosting. Add the powdered sugar and beat until smooth. Add the vanilla and milk and beat another minute. Set aside if using soon or refrigerate until ready to use. If you are piping frosting on the edges, prepare the decorator's frosting. 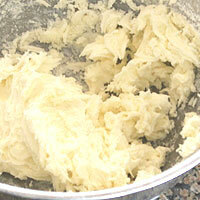 With the wire wisk of an electric mixer, beat the butter and shortening until light and fluffy 2-3 minutes. Add the powdered sugar and beat another minute. It is tempting to add the liquid at this point because the mixture looks dry and powdery. Continue to beat it and will come together. Add the salt, vanilla and milk. Beat 2-3 minutes. Place 3/4 of the mixture in a decorator's bag fitted with a Wilton tip #22. Divide the remaining frosting among two small bowls. 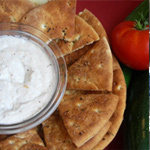 Use immediately, store at room temperature for one day, or store in the refrigerator up to two weeks. Place the first layer on the serving tray. 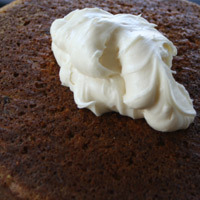 Place about 1/4 - 1/2 c of the cream cheese frosting in the center of the layer. Gently spread evenly to the edges. Top with the second layer and repeat. 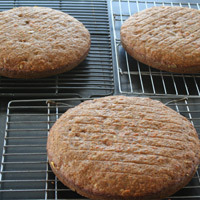 Top with the third layer and place remaining on top of the cake. Spread the frosting to one side and work your way down the side of the cake. Place the knife against the side of the cake and turn while evenly coating all sides of the cake. Be careful not get crumbs in the frosting. If you do, immediately get rid of the part of the frosting that has the crumbs. Take any excess frosting of the sides and place it on the top. Evenly coat the top of the cake. Crush and measure the walnuts. Take handfuls of it and press against the side of the cake. Take the pieces that fall off and re-position them. Cover the sides of the cake. 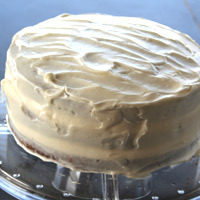 Refrigerate at least 30 minutes so the cream cheese frosting can firmly hold the nuts before continuing. 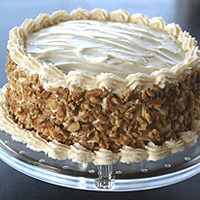 Remove from refrigerator and clean off any nuts of frosting around the bottom of the cake. Using the decorator's frosting, pipe edging along the top and bottom of the cake. For a classic edge, choose a starting point and stick tip in. Apply pressure to bag, lift, stop pressure and taper off. Start the next by overlapping the small end of the last. Any extra frosting can be divided among the small bowls. 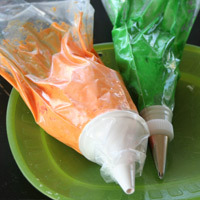 Color one of frosting orange and the other green. Trasfer the orange to a bag fitted with a medium round tip. Transfer the green to a bag fitted with a leaf tip. Practice a few before applying to the cake. You can even create them on parchment paper, let them dry, then transfer them. Mark the cake where you would like the carrots to placed. Add the carrots. This cake is good for 2 hours at room temperature. Refrigerate if it will be longer. It stays moist and delicious in the refrigerator for several days. Bring slices to room temperature before serving or microwave individual slices 10-15 seconds. The cake should bake pretty flat. If it is very domed there is too much flour. If it sinks there is not enough flour. Cakes are easy to over-bake. The center should spring back only slightly. It will continue to bake when you remove it from the oven, so don't wait until it's firm before removing it from the oven. If it sinks in the center after cooling it was under-baked. Don't take the cake out of the pan right away. It continues to bake when it's removed from the oven and needs this additional time. Also it's likely to fall apart if it's removed too soon. Don't wait longer than 10 minutes however or it can become stuck to the pan and be difficult to remove. 1. Preheat oven to 350. Position the oven rack to the middle. Prepare (1)two or three 8 or 9 inch round pans. 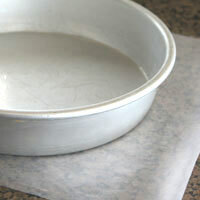 Place one of the pans on top of a piece of parchment or waxed paper. Trace around the bottom with a pen, or slide a scissors around the bottom to score the paper. Cut out and repeat. Spray the bottom of the pan with cooking spray. Place the prepared paper inside. Smooth out any air-pockets and seal around the edges. Spray and flour the paper and edges. Shake out any excess. Set aside. 2. 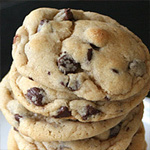 In a medium bowl add flour, baking powder, baking soda, salt, cinammon, nutmeg and ground cloves. Mix well and set aside. 3. Peel and (2)finely shred the carrots. Measure and set aside. Make the raisin or date (3)mix-in by chopping or blending them finely. Immerse in water and break apart with your fingers. Drain water and squeeze dry in several paper towels. Measure and set aside. (4)Finely chop the walnuts. Measure and set aside. 4. 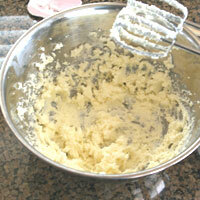 In a bowl of an electric mixer add butter, sugar and brown sugar. Beat on high 2-4 minutes, until light and airy. Add eggs and vanilla and beat until just blended. 5. 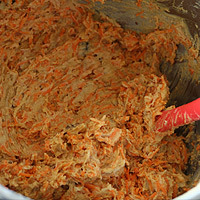 Change from the whisk to the paddle attachment and mix in the shredded carrots, raisin or date mix-in and walnuts. Mix on low until just blended. 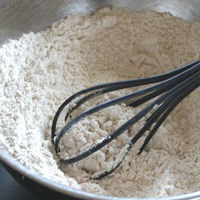 With the mixer running on low add the flour mixture 1/2 - 1 c at a time until just blended. The mixture will be quite thick. 6. Divide evenly among prepared pans. Spread as evenly as you can. Bake for 20-30 minutes depending on the size and number of pans. Remove from oven and place on a cooling rack. Let cool for ten minutes, then run a knife along the sides. 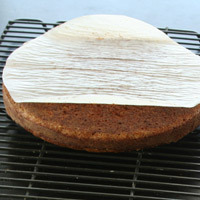 Place the cooling rack on top of the cake pan and invert. 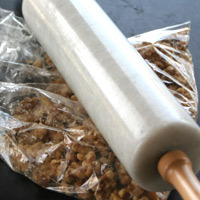 Remove parchment paper. You can let it cool like this, but I like to flip it one more time to have the domed side up. This way the cake doesn't get squished in the middle. Cool completely. 7. Prepare the cream cheese frosting. With an electric mixer beat the cream cheese and butter until smooth. 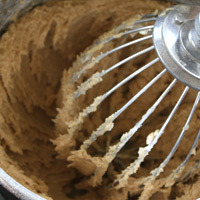 It often will get stuck in the whisks, but keep beating until it releases and begins to stick to the sides of the bowl. If you skip this step you may end up with a lumpy frosting. Add the powdered sugar and beat until smooth. Add the vanilla and milk and beat another minute. Set aside if using soon or refrigerate until ready to use. 8. 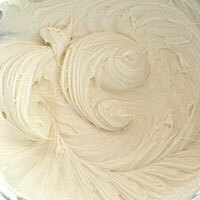 If you are piping frosting on the edges, prepare the decorator's frosting. 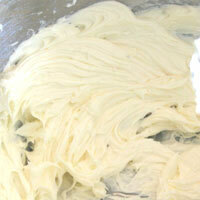 With the wire wisk of an electric mixer, beat the butter and shortening until light and fluffy 2-3 minutes. Add the powdered sugar and beat another minute. It is tempting to add the liquid at this point because the mixture looks dry and powdery. Continue to beat it and will come together. Add the salt, vanilla and milk. Beat 2-3 minutes. Place 3/4 of the mixture in a decorator's bag fitted with a Wilton tip #22. Divide the remaining frosting among two small bowls. 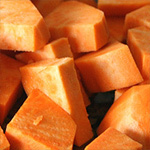 Use immediately, store at room temperature for one day, or store in the refrigerator up to two weeks. 9. Place the first layer on the serving tray. 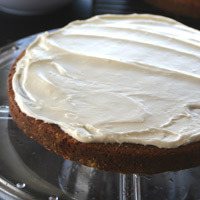 Place about 1/4 - 1/2 c of the cream cheese frosting in the center of the layer. Gently spread evenly to the edges. Top with the second layer and repeat. 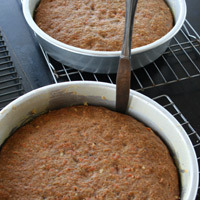 Top with the third layer and place remaining on top of the cake. 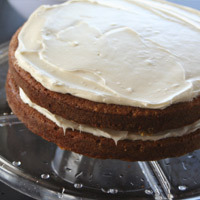 Spread the frosting to one side and work your way down the side of the cake. Place the knife against the side of the cake and turn while evenly coating all sides of the cake. Be careful not get crumbs in the frosting. If you do, immediately get rid of the part of the frosting that has the crumbs. Take any excess frosting of the sides and place it on the top. Evenly coat the top of the cake. 10. Crush the walnuts. Take handfuls of it and press against the side of the cake. Take the pieces that fall off and re-position them. Cover the sides of the cake. 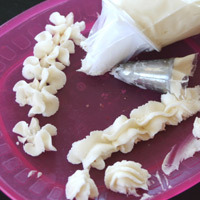 Refrigerate at least 30 minutes so the cream cheese frosting can firmly hold the nuts before continuing. 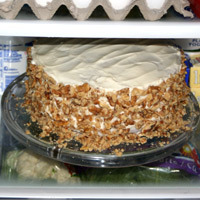 Remove from refrigerator and clean off any nuts of frosting around the bottom of the cake. 11. Using the decorator's frosting, pipe edging along the top and bottom of the cake. For a classic edge, choose a starting point and stick tip in. Apply pressure to bag, lift, stop pressure and taper off. Start the next by overlapping the small end of the last. 12. Any extra frosting can be divided among the small bowls. Color one of frosting orange and the other green. Trasfer the orange to a bag fitted with a medium round tip. Transfer the green to a bag fitted with a leaf tip. Practice a few before applying to the cake. You can even create them on parchment paper, let them dry, then transfer them. 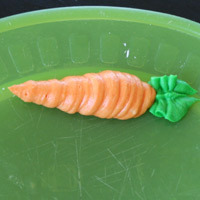 Mark the cake where you would like the carrots to placed. Add the carrots. 13. This cake is good for 2 hours at room temperature. Refrigerate if it will be longer. It stays moist and delicious in the refrigerator for several days. Bring slices to room temperature before serving or microwave individual slices 10-15 seconds. 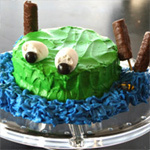 -Make and refrigerate both the cream cheese and decorator's frostings up to one week in advance. -Prepare the dried fruit mix-in and freeze. Good for several months. -Chop and measure the walnuts. 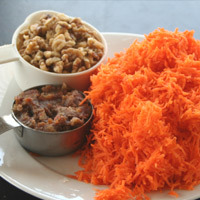 -Shred the carrots and refrigerate one day in advance. 2. 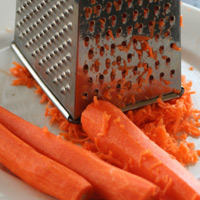 For best results finely shred the carrots using the thinnest setting on a cheese grater. This gives the cake the best moisture and taste. 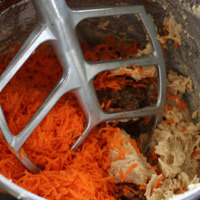 If you use a food processor or a larger sized grate you will taste bits of carrot and the cake won't be as smooth and even. 3. Using the dried fruit mix-in method gives excellent results. It adds a subtle raisin or date taste evenly throughout the cake. I like this a lot better than chewing on large raisin or date when I want to be enjoying the cake. 4. 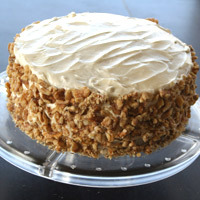 Finely chopping the walnuts disperses them evenly throughout the cake. This gives it a better taste and makes it easier to slice. 5. 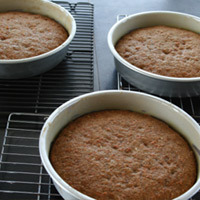 More pans with less mixture in each will reduce the baking time. Fewer and smaller pans will increase the baking time.